There is scientific evidence that soft skills predict and produce success in life. This is why most will agree investing in learning these is a smart move, and brings benefits that lasts a lifetime. Most people aren’t aware of it but we are now in the era facing the Fourth Industrial Revolution. All aspects of the way we live are constantly changing day by day, and the idea that the job you have now may not even be around in the next 3-5 years isn’t so improbable. While it is imperative that you have a solid set of hard skills, in this highly competitive environment, soft skills are what gets you ahead. 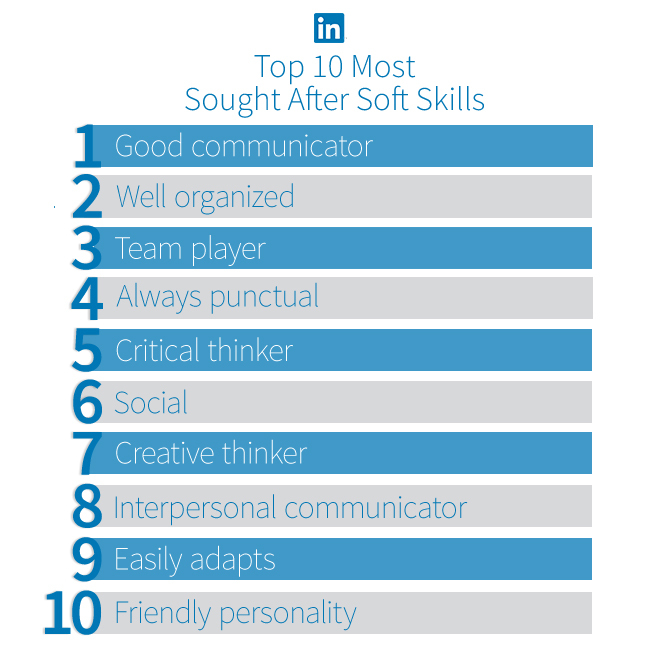 Even the workforce agrees, the #1 priority of talent developers and executives in preparing teams for the future are soft skills. However, the #1 reason employees are not engaging in workplace learning is because they don't have the time. The solution? Learn at your own time, at your own pace. The benefit of doing this is not just convenience, but also being able to customize which category of soft skills you need to work on the most. If you're wondering when you need to do it, there's no other better time than now. Never in history has there been a better time to be EXCEPTIONAL. Nor has there been a more DANGEROUS time to be AVERAGE. Before you begin, you need to do self-assessment and goal-setting. There are several free tests online that quiz you about the choices you make and your reactions to certain situations, based on these they can then can determine where your strongest skills lie and what your weaknesses are. Second, know WHY you are relearning or training. Are you moving on to a new job? New career path? Aiming for a promotion? Or are you simply invested in the idea of self-development? This way, you are able to identify what particular skills you should be aiming to learn, rather than trying to learn everything at once. A quick way to learn your strengths is to think about what others compliment and give you credit for. In the same way, to learn about your weaknesses, think about what people call you out on. Another way is to look at this comprehensive list of skills and check which ones you know you have and which you don’t. For this to be effective though, you need a good level of self-awareness, which you need the help of someone who knows you well for. To get their honest feedback, ask them to answer this Insight quiz. Based on your answer and their answers, the quiz will send you the results of how self-aware you are. Once you know a. which soft skills you have and need to improve on and b. which of those you need to get closer to your goal, you can start looking for resources to help you. Very few online courses or online materials offer a wide range of skills to improve on that are grounded on theories, informative, but at the same time entertaining and useful in not just your career but all aspects of life. Some are just plain useless and trick people in to making a quick buck for themselves, don’t waste your time downloading every single one with a flowery offer. Be wise and read up about the author, their work, and see what makes them credible. Are they experts in the field? How so? Does it cover lessons JUST for your CAREER? Or do they actually add value to YOU as a person? It’s the same with videos and podcasts. Choose what you listen to wisely and make sure they talk about specific topics that relate closely to the skill/s you want to learn. You become what you make of yourself, so have due diligence. One of the easiest ways to find out where to get the best reads or training is to search for and join Facebook groups that is about personality development, career development, (the skill you want to learn) development, or (the skill you want to learn) training. There are hundreds of FB groups with communities who talk about and share resources on these topics, and it’s best if you contribute as well. This saves you not only time, but also the dread of going through it alone knowing there are so many out there who doesn’t have the skill but is trying to learn it as well. None of what you read or listen to will matter if you do not exercise it in real life situations and challenge your current way of thinking. Commitment and having a sense of purpose surely helps during the first few times of resistance. It also helps to think small and gradually think big. An example would be if you need confidence speaking in large groups. Instead of rehearsing what you want to say for weeks or months, try speaking to a group of 3 first, then 10, then 15, then eventually let the numbers go and focus on what your mindset should be during the talk. Get feedback and take pride in changes you see in yourself, no matter how little they seem. You can also apply the soft skills you are trying to learn on ANY situation in your life, not just at work. Be attentive and look out for ways to practice it. It is also great if you can have a support group that is accountable and tells you when you aren’t committed or engaged enough. In the end, it's either you learn or train soft skills yourself, or life forces you the hard way that you need them. Nothing in life stays the same, and you cannot possibly afford to. Remember that if you want a change in career, role, or industry, you must be willing to work on the necessary changes as well.